For centuries, the fine art world forced women to fight for scraps of recognition and prove that their names deserved to be displayed next to their male contemporaries. The anonymity foisted upon female artists has always been one of the main roadblocks for both women in art history and contemporary artists, and yet it is through this anonymity that the Guerrilla Girls are able to critique the lack of representation in art. The Guerrilla Girls were founded in 1984 and is a collective group of women, with approximately 100 members over the years—two of the founding members still remain. Despite being created over three decades ago, their work remains influential and is still used as a tool to expose the gender and racial disparities in art museums all around the world. Their longevity also points to how far the world still has to go in providing fair representation to women throughout art history. 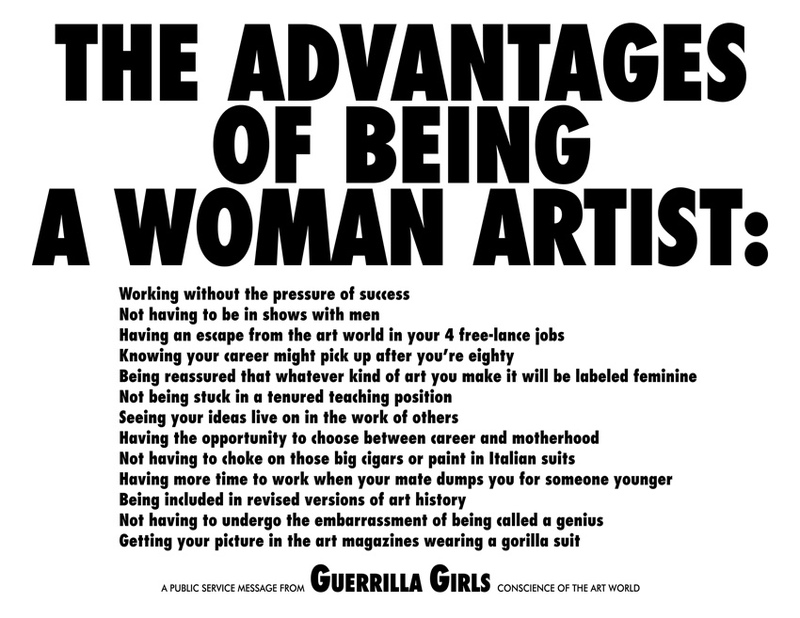 The Guerrilla Girls focus on creating posters and billboards, doing lectures, and staging protests. Their posters often confront the lack of female artists present in museums, with one of their most famous pieces, Advantages of Being a Female Artist, sarcastically pointing out how few women are in art museums, as well as the difficulties female artists face. They have successfully taken the anonymity once forced onto women and weaponized it to serve their purpose. Fighting anonymity with anonymity is an unlikely and ironic tactic, yet the Guerrilla Girls have employed it dutifully over their many years of work. “Our Story.” Guerrilla Girls, www.guerrillagirls.com/. “The Guerrilla Girls Biography.” The Art Story, www.theartstory.org/artist-guerrilla-girls.htm.